Synopsis: This book shows how nurturing ourselves is the most productive thing we can do to thrive professionally and personally. Emma Seppälä PhD is Science Director of Stanford University’s Center for Compassion and Altruism Research and Education. Her areas of research include positive organisational psychology, health psychology, cultural psychology, well-being, and resilience. She has used her knowledge and research to write a book explaining that behind our inability to achieve sustainable fulfilment are counterproductive theories of success. Success doesn’t have to come at our personal expense. Drawing on the latest research into resilience, willpower, growth mindset, stress, creativity, compassion, mindfulness, gratitude training and optimism, Seppälä shows how nurturing ourselves is the most productive thing we can do to thrive professionally and personally. 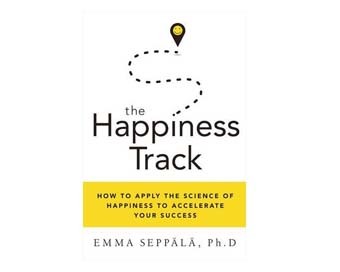 Filled with practical advice on how to apply these findings to your daily life, The Happiness Track could be a life-changing guide to fast-tracking your success and creating an anxiety-free life.